Mash, chips, roasties, baked spuds; sorry all these forms of serving up Britain's favourite tuber might be delicious but they are so passe. 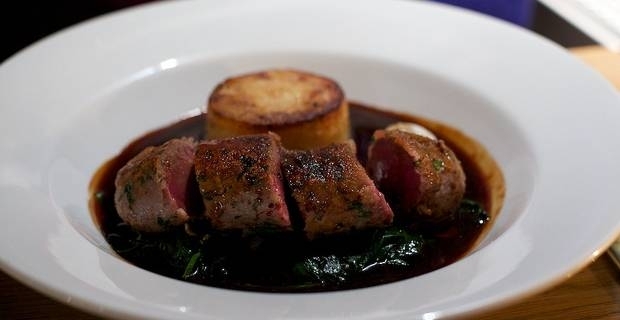 In smart circles fondant potatoes are the only option for that stylish accompaniment to a perfectly-cooked rack of lamb or a delicately-seasoned venison fillet. Blame Masterchef for this latest trend. Fondant potatoes do look elegant, especially if they are perfectly symmetrical, beautifully crisped and tender to the knife. Although they seem like the stuff of fine dining restaurants, great results can be achieved at home with a little care and basic cooking skills. First choose your potato. Floury potatoes like Maris Piper are probably the easiest option for the home cook, although there are some chefs who believe a waxy potato can produce a more flavoursome version. The potato must be peeled and cut into a barrel shape, with flat top and bottom edges A sharp cookie-cutter can be a useful tool here, although specific fondant potato cutters are available. Melt 150 grams of butter over a moderate heat, ensuring it doesn't burn, then add the potatoes once the butter has stopped sizzling. Brown each flat face for about five minutes. Add 50 millilitres of stock or water to the pan and allow the potatoes to simmer for at least ten more minutes or until a knife can pierce the potato at the side. Getting the perfect balance of crispy outside and yielding centre is tricky and might require a few false starts before you perfect it. Adding herbs and garlic to the stock will add interesting flavours to the fondant potatoes. Fondant potatoes are a dish best served immediately they are cooked. They are not at their best if left lying around or reheated. At their best they have a rich, buttery flavour that sets them above most potato dishes and they also look very enticing as an accompaniment to highly-flavoured meat dishes.